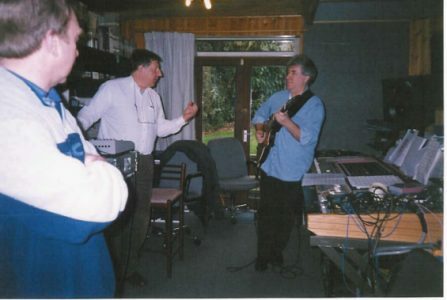 In the Bromsgrove studio, Colin Frechter and Terry Bradford add a guitar track while Maurice Hopkiss (pedal-steel guitar and fiddle player) looks on. Terry Bradford was formally part of the group "Co-Co", who represented the UK in the 1978 Eurovision Song Competition. "Co-Co's" Eurovision single 'Bad Old Days' reached number 17in the charts in May of that year. 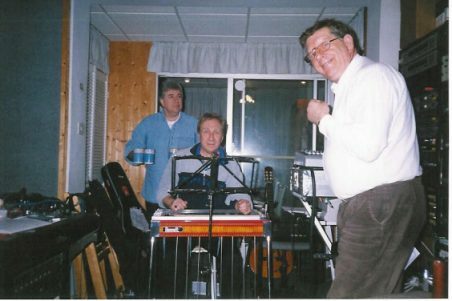 Maurice Hopkiss played pedal-steel on Don McLean's UK number 1 hit 'Crying'. Says Maurice in his strong Midland's accent, "People think that 'Crying' was recorded in Nashville, it wasn't! It was recorded here in Pebble Mill, Birmingham!" While Maurice Hopkiss and Colin Frechter check the sound levels for the pedal-steel guitar, Terry Bradford arrives with the coffees. 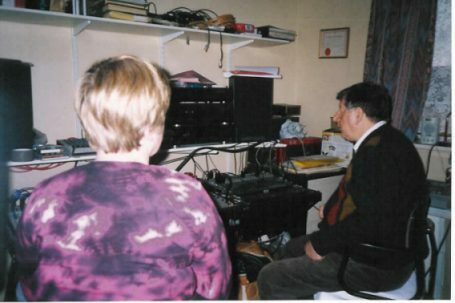 Maurice is a talented lad, as he also played the country fiddle parts for Caroline's album. © Copyright Coda 2001. All rights reserved worldwide.